City of 10,000 Buddhas - Do We Really Recite with Full Concentration at All Times? Full Concentration at All Times? Amitofo. My name is Heng Hwei. First above all, I'd like to thank everyone at CTTB, from branches of Dharma Realm Buddhist Association and from the group of people I met at Buddha Root Farm for dedicating merit to me when I was in the hospital. In the middle of August I fell ill, was sent to the Ukiah Valley Hospital's Emergency Room, and then flown by helicopter to the California Pacific Medical Center in San Francisco because I had liver failure. The second person I'd like to thank is the liver donor, for donating a liver to me. I am grateful that I'm still alive and can talk to all of you tonight. The third group of people I'd like to thank is the staff, the nurses and the doctors of the California Pacific Medical Center. They really dedicate their lives to saving other people's lives, including mine. I see their smiling faces all the time. They greeted me with genuine smiles; it was really something that came from the bottom of their hearts. Like the Master said, people who work at hospitals really bring forth great vows and practice the Bodhisattva Path to benefit other people. How did I end up in the hospital? Because my Iiver wasn't working. I guess I must have killed someone in my past life and that person had come back for my life this time. I remember during the first few years I left the the home-life, I used to have dreams that a group of people would come for my life. They came and stabbed me to death. Luckily I could always get up and walk away from death. These dreams were probably telling me I was supposed to die early this life, but I was rescued and am able to talk to you tonight. In everyday life we may have conflicts with people and we are not happy. The first thought that might come up is to blame the other person. We don't know how to reflect and see our own faults and change. We just blame others and don't forgive them. From my years at CTTB I realize that we need to transform our thoughts of hatred into compassion. We should not have hateful thoughts that go round and round in our heads, because in the future these thoughts may turn to killing, which would cause us to continue to transmigrate in the cycle of rebirth. If we want to know whether we have thoughts of hatred, we should look at ourselves. Are we always unhappy with others or unhappy with ourselves? If we are that way, we should change. Otherwise, what is the point of residing in a monastery? It would be futile. Another thing, I'd like to share is that when I was hospitalized, I did not recite the Buddha's name. No, I didn't. Why? Because when I was in the hospital for the first two days, my doctor told me I would need a liver transplant or I would die in a week's time. After the transplant I would have to take medication for the rest of my life. This truly shocked me; I didn't and couldn't believe that I was going to die. It was very hard for me to quickly uphold the Buddha's name and recite so that my life would be safe at that time. Instead, I was more happy to talk about the City of Ten Thousand Buddhas. Each time when I mentioned I was from the City of Ten Thousand Buddhas, those doctors or nurses were very happy to hear the name of the City of Ten Thousand Buddhas. I think they have some good roots. In the hospital they let me play the chanting of the Buddha's name. When they came into my room, they would comment on the chanting, saying it's so soothing and it had a good tune. 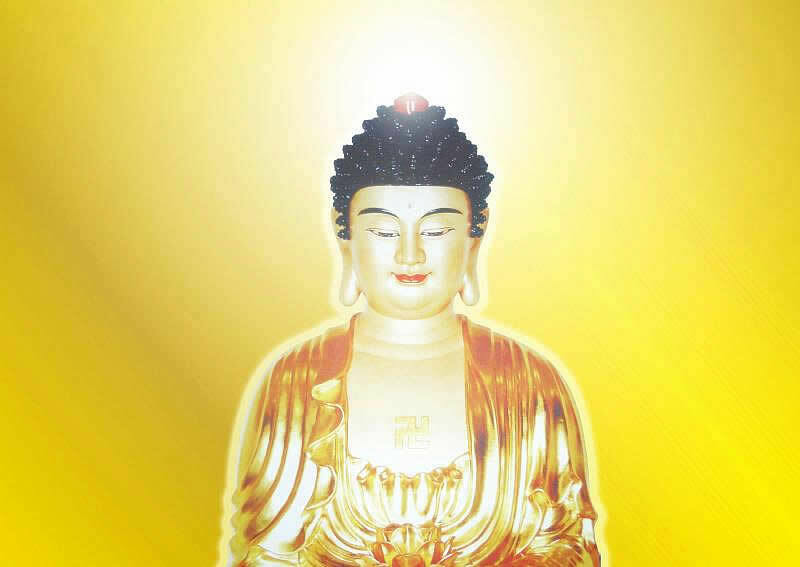 Even though I listened to the chanting of the Buddha's name, after some time my karmic obstacles caught up with me once more and the chanting changed into something else; I didn't even hear "Namo Amitabha Buddha" clearly anymore. So I listened to the Great Compassion Mantra instead. When I heard it very clearly, I was so happy that I said to myself, "I'd like to drink some Great Compassion water." I asked for some Great Compassion water from Gold Mountain Monastery and also accepted some from a nun who recites the mantra. I drank a lot of that water. In the end, the mantra recitation changed as well and it wasn't very clear to me anymore. After two weeks in the hospital, I had my liver transplant. I had my surgery on Saturday. When I woke up on Sunday there was pain in my tummy. I was sleeping from day until night on Monday. I was half awake and talking to myself. I had already forgotten about waking up the next day and asked myself why I'm still groggy from surgery; I still couldn't regain consciousness and I kept talking. I tried to recite the Great Compassion Mantra, but because the anesthetic was too strong, I couldn't recite the mantra at all. I also couldn't figure out what my name was. Luckily I was able to remember the six-syllable mantra, Om Mani Padme Hum, and I recited it for some time. After a while I also got confused and couldn't recite any longer. We normally say, "Oh, I've been reciting the Buddha's name for a long time, for many years. I recite thousands of times a day." Do we really recite with full concentration at all times? This is the point I'd like to emphasize to all of you tonight. If we recite without concentration, without full effort, then we won't have any skill to end our cycle of rebirth and won't be able to get reborn in the Pure Land. From my experience, I failed the test. I know what it is like. Maybe there are people who think they are doing a good job at reciting the Buddha's name, but until they get tested, they won't know where they really are in their skills. I remember the Master said that we must recite the Buddha's name "Namo Amitabha Buddha" with concentration and energetically. We have to recite all the time until we can recite single-mindedly, until the recitation of the Buddha's name automatically continues even when we are not reciting. Then we'd have some skill in our cultivation. If we just casually recite and don't get that kind of response, we have to apply more effort in reciting the Buddha's name. When I heard that I was going to die, even though I didn't accept it, I had a thought of regret. I regretted that even though I've left home for so many years, I never really kept my mouth karma pure at all. I remember the Master saying that when people are going to die, they will regret things they did wrong in life. But if we wait until that time. it would be too late because we'd soon die. I didn't know I was going to die until the doctor informed me. At that time, the impact of his words wasn't so strong, because I had yet to fully sense the impending death. However, it still triggered thoughts of regret that I was not able to keep my mouth karma pure. It's because of the aid from the Buddhas, Bodhisattvas and the Venerable Master Hua that I'm safe today. I hope from now I can start a new life, a new beginning and I can become a better person. Namo Amitabha Buddha!